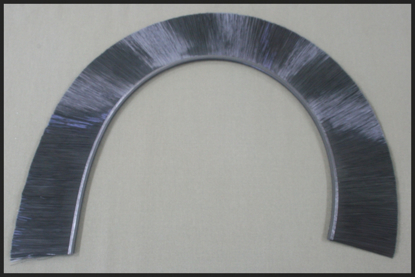 DETERMINING BRUSH RING SIZE: The ideal is to use a brush length that will result in the tips of the brush touching the work piece just before the bit touches. If there is a gap, material will be lost. Conversely, you don’t want to overly compress the brush if you don’t have to. The brush is embedded in ½” thick acrylic, so for the 3” brush ring the tips of the brush will be 3-1/2” below the bottom of mounting plate that is clamped around the router (2-1/2” for the 2” brush ring). By taking measurements with your longest and shortest bits, you can determine which brush ring is best suited for your machine. 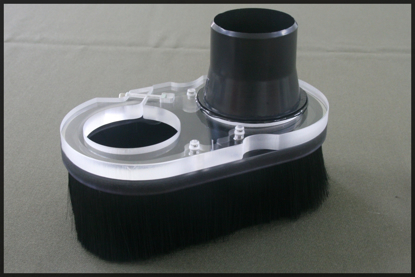 Note that ½” thick spacer rings are also available that are sandwiched between the top mounting plate and the brush ring to adjust the brush downward in 1/2" increments. MOUNTING CLEARANCE: The top plate clamps around the body of the router/spindle. There must be approximately 0.6" of clearance between the spindle and the z-assembly for most standard shoes, but some need as much as 0.85". If you have a potential interference issue, please contact us before ordering. INSTALLATION NOTE: Care must be taken when installing the shoe so as to not over-tighten the pinch bolt. The pinch bolt should be tightened until the shoe is snug on the router/spindle. Over-tightening the pinch bolt may damage the shoe which in turn could cause bodily harm or equipment damage. Discontinue use if the dust shoe becomes damaged. INCOMPATIBLE WITH DUAL BEAM GANTRIES: Our shoes are not compatible with machines that have dual beam gantry with the router/spindle mounted between the beams. There is typically no way to route the dust hose to the connector from above on those machines. The cooling exhaust on most routers blows down and outward. The exhaust on the Hitachi blows straight down and reduces the collection efficiency. Add this to your Hitachi dust shoe to improve the collection efficiency. This is replacement brush for one dust shoe. It measures approximately 26" in length. If multiple quantities are ordered, the brush will be sent as one continuous length. Select either 2" or 3" filament length. The Mini Split-Shoe is provided with a 2-1/2" quick connector compatible with most shop vacs. The Mini Split-Shoe is much smaller (8”x4.75”) compared to our standard shoe (10.5” x 6”). This new shoe is engineered for smaller machines and is provided with a 2-1/2” quick connector that is compatible with most shop vacs. 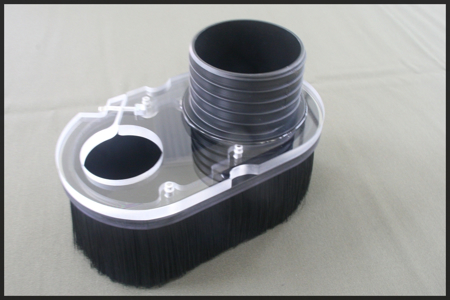 When ordering, select either the 2" or 3" brush ring. See below to determine which brush ring you need.